Rescue Maria in the thrilling bonus chapter! Lots of hidden symbols and morphing objects to find! Find souvenir picture pieces to complete a secret image! Earn achievement and replay your favorite mini-games and HOPs. Enjoy exclusive screensavers, wallpapers, concept art, and music! 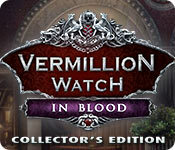 Vermillion Watch: In Blood Collector's Edition is rated 3.6 out of 5 by 25. Rated 5 out of 5 by sadcypress from Excellent Game The graphics are so beautiful and the game is fun. I want the bedroom! I want the antique jewelry and vanity table items in one of the HOGs. The scenes are interesting, spellbinding and relaxing. I love this game. Rated 5 out of 5 by codom from Love this Game....and Series! I'll start by saying that I'm not always the biggest Eipix fan, especially most of their most recent fare. However, I love this game and series. So often Eipix games lose their momentum quickly but these games manage to hold the excitement throughout, at least for me. I recommend this game highly. My only question is why the graphics and game length in so many of their other recent games don't match that of these games. Rated 5 out of 5 by difficult1 from Excellent Thank goodness for the Vermillion Watch series. This game was worth every cent. So many of these games have been disappointing; same old games and same old story line. This game takes a long time to finish. So many of the mini games are new and different enough to warrant surprise. Well done Eipix. I've really cut back on how many games I buy because now they all seem to be so similar. This one stands out. Really worth the time and money. Rated 5 out of 5 by CelticWolf80 from Great Game loved it very much I can wait for more challenges from this serie! Rated 5 out of 5 by WhiteladiesRd from Is Blood Just Red or Vermillion Red? I am exhausted, drained, yet elated to have finished this game and I feel excited, satiated! The Vermillion Watch did this! I didn’t do much else than playing „In Blood“ this weekend. For hours and hours, fun hours, at times a bit frustrating, but aren’t the best things in life those you have to fight for? I didn’t ruin my mouse hitting it with a stylus, as I was not fast enough clicking it the usual way to overcome the challenge on the roof of the train. To compensate I stayed on the roof much longer than necessary, I just enjoyed the wind in my hair and the views before tackling a new task. Graphics, music, puzzles, a total of great ingredients. Plus an interesting story! And many, many HO's with interesting twists. A challenging, satisfying game that pulls out so many stops and leaves you wondering if it ever could be topped. But not all stops have been pulled, so I’m looking forward to new surprises. After all, Blofeld, archenemy of James Bond, appeared in seven movies. The Red Queen has some catching up to do! Rated 5 out of 5 by biscuitsmama from SINK YOUR TEETH INTO THIS NEW VERMILLION WATCH GAME Are there really such things as vampires? Perhaps you will find the answer to that question as you play this new Vermillion Watch game – In Blood. There has been a series of ghastly murders in Whitechapel recently where each of the victims died of exsanguination. The Watch has called you in to work on this case young Hawkes and as Phineas Fogg briefs you on the case he lets you know that he has called in Maria Shelley to help you, since she is the Watch’s expert on anything that might require medical expertise. When you and Maria arrive at the scene of the latest murder you find that Maria has brought along her reanimation equipment that will be used to revive the victim for a short time so that she can tell you who murdered her. As you are seeking answers, a cloaked figure attacks and almost manages to kill Maria. It looks like someone doesn’t want you involved in the case. 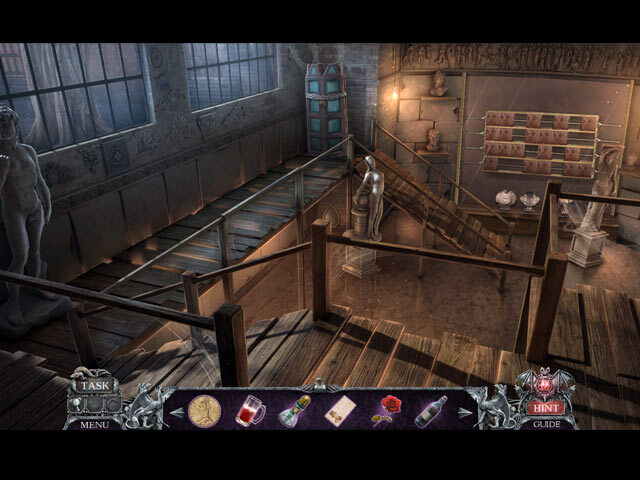 Maria asks that you call in Dr. Jekyll to assist with the strange findings she has found but shortly after you meet with Dr. Jekyll, he is kidnapped. Now you and the Watch must work to save Dr. Jekyll before it is too late. What is the kidnapper’s plan and why do they need Dr. Jekyll? Find the answer to this question as you play this exciting new game in the Vermillion Watch series. As is the case in all the Vermillion Watch games you will have a trio of evildoers to catch up with. Each villain is in a different location and as you take your preliminary evidence to Rufus you will be able to select the order in which you wish to visit each location. The HOPS are excellent and well-designed with some of them being multi-level. The first HOP in the game ends with an interesting puzzle that I haven’t seen before; in fact, many of the scenes seemed to be more puzzle-like in style which, IMHO, made them far more entertaining than usual. The puzzles are very creative as well and, although some of them might seem easy, overall they contained more difficulty than usual. Thankfully I purchased the CE and have been able to use it when I was stuck on solving a puzzle or making my way around in the game. For me this game is the best in the Vermillion Watch series. It looks like EIPIX has listened to the comments of many gamers and stepped up the entire level of challenge with this game. It didn’t seem like there was as much hand-holding in the game and it took me quite a bit of time to find what I needed to make some progress. Again, the Strategy Guide came in handy and I seemed to use it more than I have in ages. Normally I barely glance at the guide and then only if I am stuck locating a collectible item. The CE version of the game includes the following extras: Morphing Objects that can be found in the HOPS, Collectibles in each scene of the game, Achievements to earn, Pictures that include the Wallpapers, and Concept Art, Music, Videos, a Bonus Game, and the Strategy Guide. You can also replay 21 HOPS and 29 Puzzles. I would recommend that if you are new to playing HOPA games you consider purchasing the CE because of the in-game Strategy Guide – you might need to use it. I love this game that for me is by far the best game in the Vermillion Watch series and one that might be a contender for game of the year. Although I am not a fan of the Dracula theme, this game is so well done and intriguing that I found myself very involved in the action. I don’t like snakes and had a jump-scare moment or two in the game, particularly when I opened a door and there was a huge snake right in my face. So be warned if you happen to really hate snakes or have Ophidiophobia, there are a few of them in the game. As always, please try the demo to see if Vermillion Watch In Blood is a game you will enjoy. Happy Gaming! Rated 5 out of 5 by sunnyglow from ANOTHER “BLOODY” GOOD GAME IN THE VERMILLION WATCH SERIES REVIEW BASED ON THE ENTIRE GAME – Time: 5 Hours 5 Chapters plus a Bonus Chapter – Strategy Guide: 52 Pages OVERVIEW: You are off on another blood-curdling case set in the dark, crime-ridden underground of Victorian London! The Vermillion Watch again needs your help. Your next case takes you to Whitechapel where victims are being found drained of blood. A triumvirate of evildoers, Carmilla, Mr. Varney, and Mr. Dracul, (along with some secret evildoers) are behind these attacks and it is up to you again Hawkes to save the day. When Dr. Jeckyll is kidnapped, you and the whole Vermillion Watch will have your hands full attempting to save him in an action-packed game! There are some surprises in this game– be prepared! This is a good adventure game. It should appeal to those who love this series or those who like Steampunk adventure games. Science meets the Victorian age in this game. There is plenty of name dropping as well as both historical and fictional literary characters, appear side-by-side within this game. The story is loosely based a vampire theme – with a scientific twist. The graphics well-portray Victorian England. This is an action-packed game with plenty of activities to keep you busy. As with the other games in the series, you will have the choice to play each of three locations in whichever order you choose. MECHANICS: Snake alert! 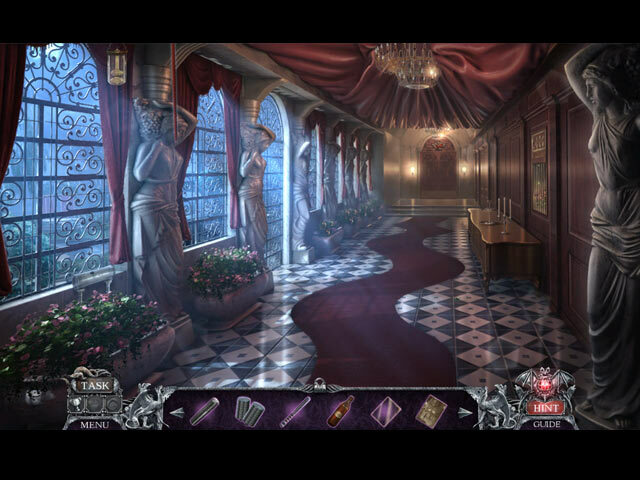 There are quite a few snakes within this game – most within the residence of Carmilla. There are more puzzles than HOP scenes. There are two collectibles and they are easy to locate. There are fifteen (15) achievements to earn. There are forty-two (42) signs which look like large drops of water and twenty-four (24) morphing objects. The morphing objects appear in both the gaming scenes and the HOP scenes. You can replay twenty-four (24) HOP Scenes and twenty-nine (29) Puzzles. You get a device from Rufus to help you in your quest. You also visit other members of the Watch to help you analyze materials and data. There are nine (9) wallpapers, three (3) concept art pictures and a souvenir room, BONUS CHAPTER: The bonus chapter is a sequel. Maria has summoned you for help. She is on the verge of death. Someone was using her to gain immortality. Now you must revive her. I have not played the entire bonus chapter. However, it appears to be of a decent length. HOP SCENES: There are twenty (20 In the main game. They are similar to ones seen in many of their other games. There are several multiple-step ones throughout the game. Most of these combine a silhouette scene with a list of items. There are two storybook scenes and a few matching scenes after the demo. It is evident that EIPIX spend a great deal of time creating these scenes. They are creatively designed and thematic. FAVORITE HOP SCENE: My favorite scene is one from the opening scene of the bonus chapter. It involves rotating and switching three wheels to put halves together of an item to be removed. I have seen a variation of this scene before. However, I do love this type of scene and it is seldom used within these games. PUZZLES: There are forty (40) puzzles in the main game. They vary in style and difficulty. 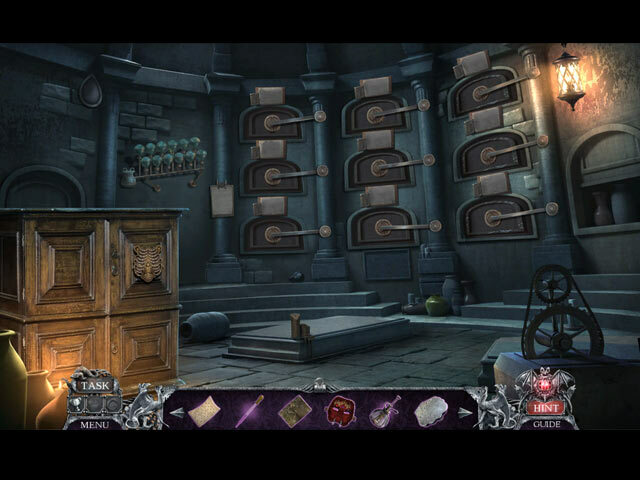 Most of the puzzles are easy; however, there are some harder puzzles toward the end of the game. PUZZLE WOES! I did have trouble with a few puzzles. In one in which you need to read dates assigned to portraits, the numbers were so small and blurry, I had trouble reading the dates. There is also a physical puzzle (used twice in the game) in which you must click an arrow continuously to fill up a bar to balance yourself on the top of a moving train. I kept clicking – and clicking – and clicking (rapidly as well) and could never get it to fill up the bar. However, for once, the puzzle directions were superb! HERE ARE THE DETAILS (SPOILERS) FOR SOME OF MY FAVORITE PUZZLES AFTER THE DEMO: A. Oil is where it’s at! Mathematical puzzle. Fill up four lanterns with three cans of oil with specific units of oil., 5, 3, and 2 units. All the lanterns have different amounts of oil to fill them. All must be filled to the top and there should be no oil remaining. B. Light up the world – with oil! Weights and balances puzzle. Taking the lanterns from the previous puzzle, hang them on chains so that all the lanterns are level with each other. Each lantern weighs a different amount C. What’s your sign? Multiple-step puzzle. (1) Matching puzzle. Match up zodiac symbols with their constellations in the sky. The stars will light up when the symbol is in the correct position. (2) Connect the dots puzzle. Using stars as dots, create six (6) constellations by connecting stars to create them. D. Age is just a number. Sequence puzzle. Move twelve (12) photos of Carmilla so they are in sequence from oldest to youngest by date. E. What is a vivarium? Maze puzzle. Maneuver a snake using an enchanted flower from one corner of a vivarium to the other end to capture its venom F. How does your garden grow? Assembly puzzle Grow a series of flowers by following given directions as to the right combination of seeds, fertilize, light and water G. Get away from me! Rope puzzle. Separate snakes so that none touch each other. H. Atomic foolery! Connection puzzle. Connect all the lines between atoms without retracing your steps. 2X I. Difficult as it gets. Rotate six wheels embedded with parts of symbols so that they create six symbols shown at the side and the top of the screen. DIFFICULT J. Don’t fence me in! Entrapment puzzle. Entrap the token of an evildoer by using five other tokens of the Vermillion Watch to surround it so it cannot escape out of the grid. Rated 5 out of 5 by rainworm from A strange meeting of mystery celebrities or who is behind the Whitechapel serial murders The fourth installment of the Victorian mystery series has invited even more literary characters to the game: in our case vampires seem to be the culprits, one of them a well known count! But first comes first: We play as Hawkes, as usual, member of the Vermillion Watch. A new case attracts our attention: A series of brutal murders in Whitechapel, all victims are female and drained of blood. This time Maria will be part of the investigation team and accompanies us to the crime scene of the latest victim. Her part will be quite special, as she will try to revive the victim for a short time with the help of a machine, in order to question her. It is not much, the victim can contribute, but her words point to the tavern opposite and the horse statues that surround the square. Further details will help us: a mask, we found behind a statue and a purplish substance on the victim. We ask for Dr. Jekyll (name is NO coincidence) to examine this. In the tavern, the barkeeper points out his special guests (Mr Varney, Miss Carmilla and Dr Dracul), after we have shown him our permit. We may have a look around, though the guests are not easily to approach. Each of the three has a peculiarity but all of them carry a capsule with a purplish substance in it. First clues? Yes, but we need to know more about these characters and take steps to enter and search their rooms. They turn out to be not normal people but are they vampires? After following them through the maze of the underground tunnels of London, they confront us and take Dr. Jekyll, whom they want to join their circle as his second self, Mr Hyde. And then a person appears, who we thought defeated, the red queen. She outs herself as the head of this conspiracy. Back in the headquarters of the Vermillion Watch we need to develop a plan. Vampires? The answer Rufus suggests, is no, something or somebody real should be behind the events. Though a bit strange to meet the different protagonists of various famous gothic novels in this game, it has a certain fascination. Carmilla, Varney and Dracula, forming a triumvirate , the red queen, whom we thought, was defeated, returns – seems, we have quite illustrious opponents, let’s see, how we fight them. HO scenes are superb in this game, variable and not plain lists. They are nicely placed in the game flow, as well as the puzzles. Most are challenging but not too difficult and ‘doable’ .